Initially enlisting (against his parents' wishes) during the Spanish American war in 1889 as a 1st Lieutenant, but mustered out shortly after. He re-enlisted as a Private in June 1899 into the 9th Calvary (The Buffalo Soldiers) spending time on the western frontier. With Lieutenant Charles Young's tutoring, he passed the Officers Candidate test in 1901 and was commissioned as 2nd Lieutenant. He served again with the 9th Calvary during the Philippine insurrection, during 1902, and when the 9th Calvary was deployed to Liberia in 1911/12 as well as their patrolling of the Mexico/US border during 1912. He returned with the 9th Calvary to the Philippines from 1917-1920. Between the gaps of his deployments with the 9th Calvary, he taught Military Science and tactics at Wilberforce University and Tuskegee University. He had the honor of escorting WWI Gold Star Mothers and Widows to the burial places of their soldiers during the summers of 1930-1933. 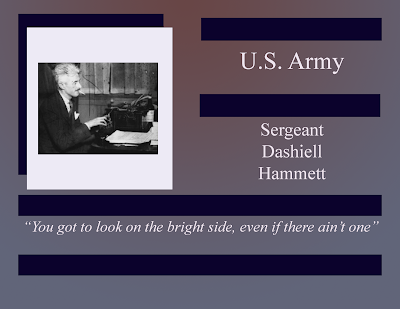 In 1938 he was assigned to the 369th infantry and was appointed Brigadier General on October 25th, 1940 by President Roosevelt, becoming the first African American to achieve that rank in any US Military branch. 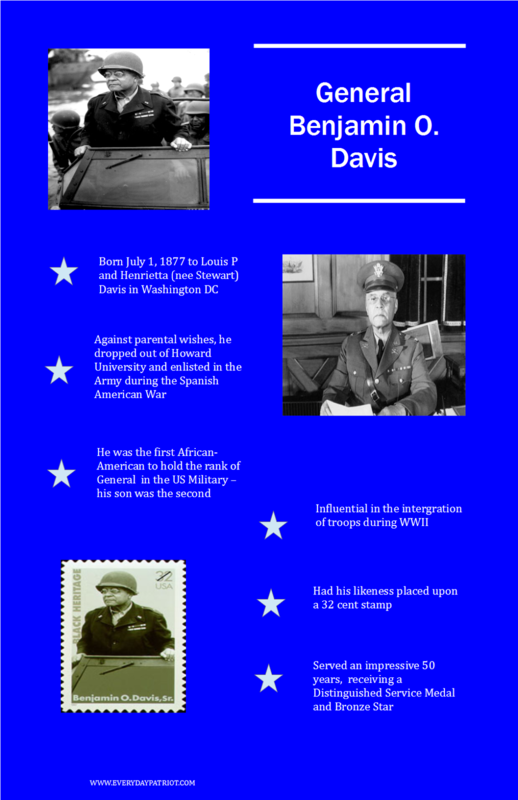 General Davis was assigned to the Office of the Inspector General, as an advisor to African-American military policies. 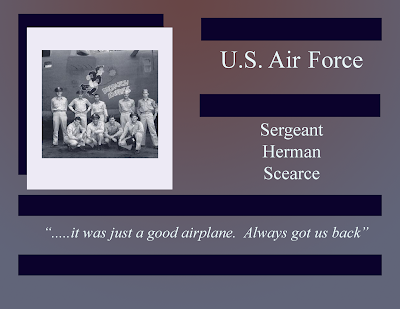 His inspections during the European Theater was influential in military troop integration. 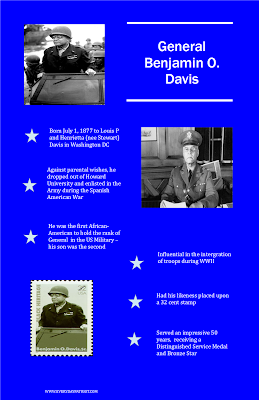 General Davis retired on July 20th, 1948 after a 50-year military career, with a public ceremony presided over by President Harry S Truman. 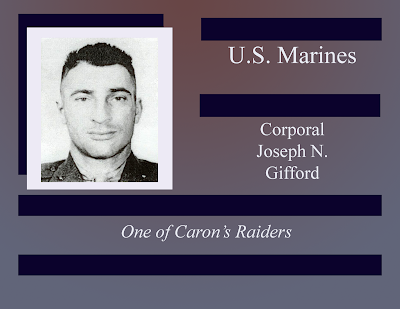 During his military career, he received the Distinguished Service Medal and the Bronze Star. After retirement, he served as a member of the American Battle Monuments Commission from 1953 to 1961.